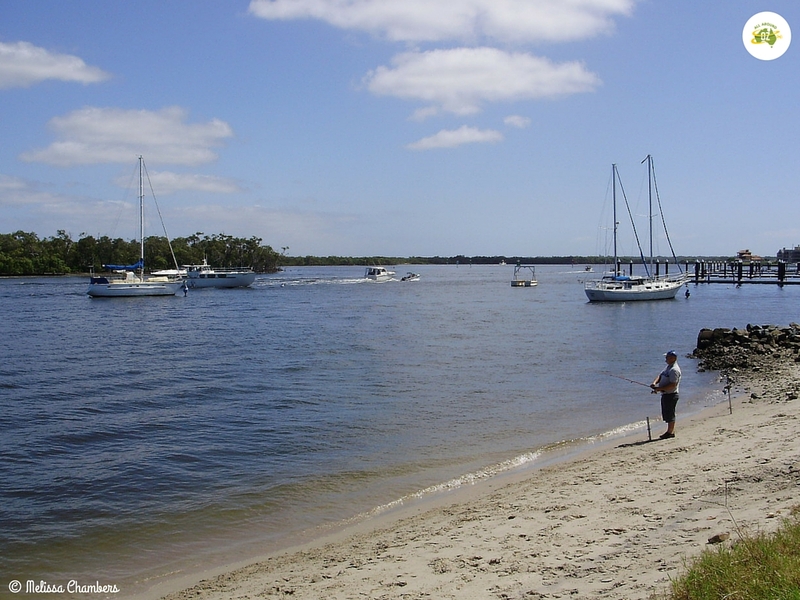 The northern Gold Coast suburb of Paradise Point has been one of our absolute favourite spots to spend time as a family ever since we first moved here in 2005. Located about 30 minutes drive north of Surfers Paradise and right on the Broadwater, this gorgeous spot has something for everyone. Paradise Point is the perfect spot to while away a few hours fishing. Starting on the southern side of the Ephraim Island Bridge, the foreshore park area extends for almost two kilometres. There is a lovely wide footpath/cycleway that now continues north beyond the Sovereign Island Bridge. It then becomes a boardwalk that runs around the northern most tip of Paradise Point bringing you out at the Salacia Waters development on the western side of the Broadwater. Dotted along the walking track are various pieces of exercise equipment that you can use to add a bit of variety to your walk. The area is popular for walkers, joggers, cyclists and dog owners all year round and at any time of the day. The central area of Paradise Point Parkland’s is filled with a fantastic play area for kids of all ages. There are also a couple of smaller play areas in the northern section. There is also a fantastic enclosed swimming area and lovely sandy beach which is very popular in the warmer months. 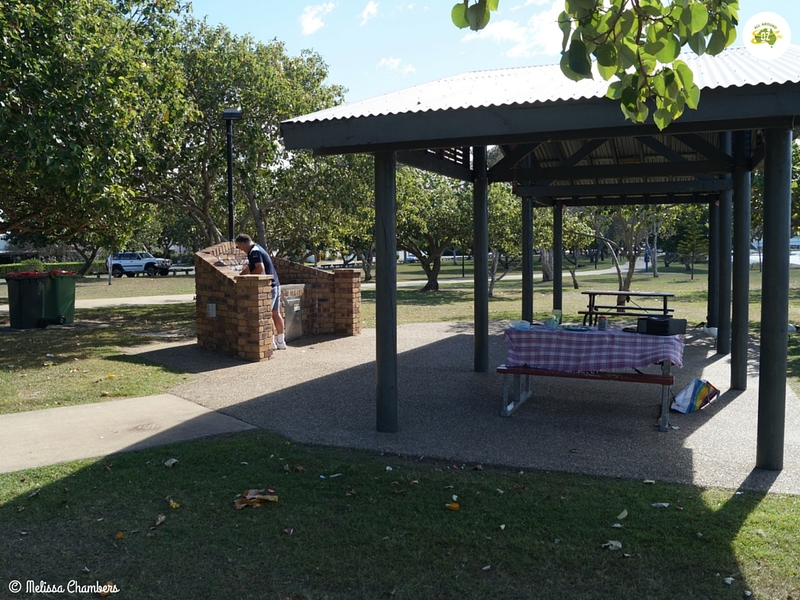 But perhaps the best part of the whole area is the abundance of barbecues and picnic areas. Whether you want to catch up with family, hold a birthday party or just have a barbecue breakfast and relax for awhile this area is ideal. It can get very busy, especially on the weekend. We have a favourite picnic area on the southern side where it is usually a bit quieter. The barbecues are generally always available or if not you don’t have to wait long. There are picnic tables nearby to the barbecues. Or there is plenty of green grass to throw a rug down on. The kids can bring a footy, their skateboards or just climb a tree! This is just one of the awesome BBQ areas at Paradise Point. And as you can see…..blissfully empty during the week. If you feel like eating out there are some fantastic cafe’s and restaurants just across the road from the main playground area. A favourite for take away is Billy’s Chicken. They have an assortment of different hot foods including chicken (of course), hot chips and a variety of salads. Coffee shops are of course a favourite with me. Paradise Point is an ideal spot to catch up with friends for morning tea or lunch. Cafe 7 does an awesome breakfast. The Point, BRICK and Alora all do great coffees, with Alora always having a yummy selection of home made treats. If you like fish I recommend Savannah. Either dine in or take away their meals are always yummy! L: Fresh juice and Banana Bread from BRICK. 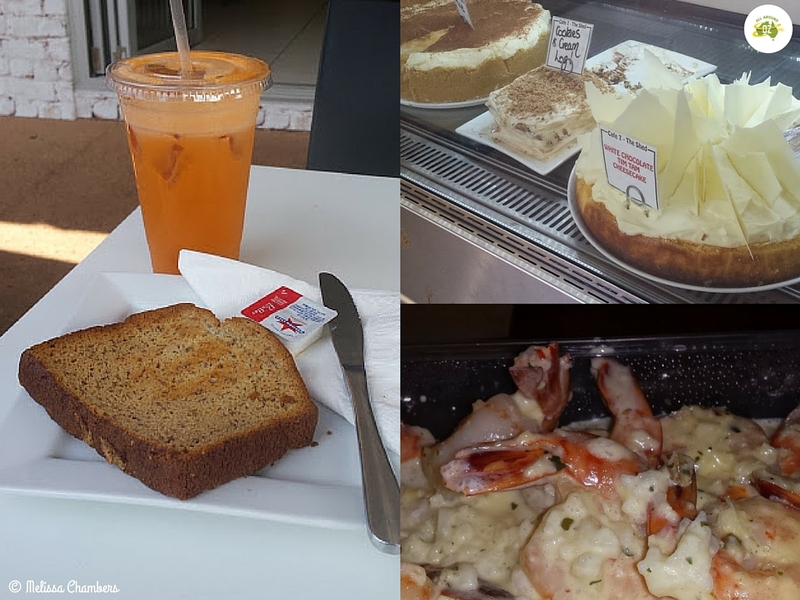 T: A selection of the yummy desserts available at Cafe 7 B: Garlic Cream Prawns from Savannah. 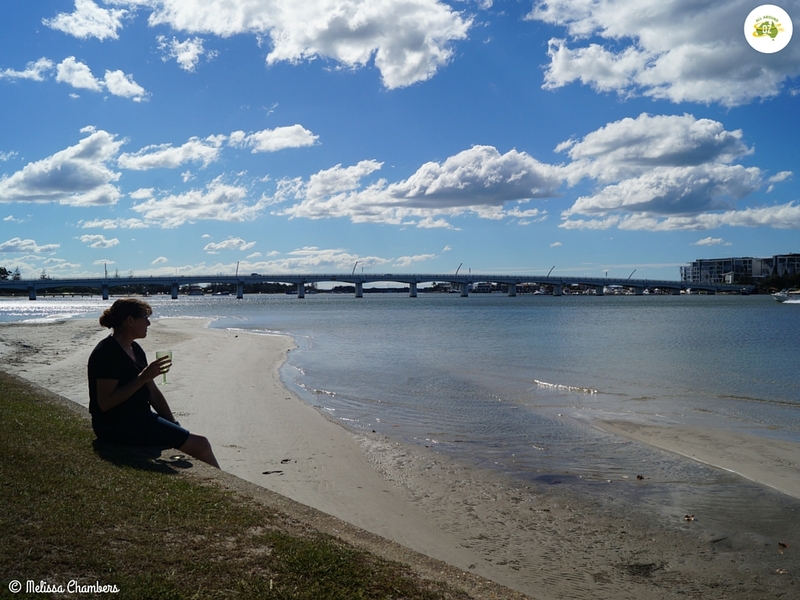 Of course if you just want to sit quietly and read a book or just take in the peaceful Broadwater views then Paradise Point is the spot for you too. I always find sitting by the water relaxing! If you are a bit of a sticky beak and like to see ‘how the other half lives’ take a drive over the Sovereign Islands Bridge. There you can check out some of the multi million dollar houses! I’ll stick to my little house thanks….less housework. That looks like a gorgeous spot, perfect for a picnic! And it’s always good to have a bit of local knowledge so you can skirt the crowds. I also like places where there’s some nice food to buy if you want, in addition to your picnic. And what a great view! I will often go and get a coffee and cake and just sit in the park and watch the boats cruising by. Very relaxing. Paradise Point is a very pretty spot on the Gold Coast. I love the abundance of boats and yachts up this end of the coast. It is very different to the southern end. I love how the Coast changes between north and south. Very diverse.